A twin-turbo V6-powered coupe would be cool. Hint hint. 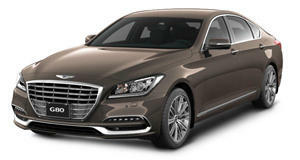 The New York Auto Show is special for Genesis, the new standalone luxury brand from Hyundai. It was in the Big Apple, way back in 2007, when Hyundai unveiled the first Concept Genesis. One year later, the Genesis Coupe had its debut at the same venue. recently spoke with Genesis chief Manfred Fitzgerald during a golf tournament (specifically, the Genesis Open) out in California about the brand’s New York plans late next month. "We'll show something at the New York show," Fitzgerald told . “If you happen to be in town, you should not miss this one." Not surprisingly, Fitzgerald refused to go into specifics just yet, but this new vehicle, concept or production, could have far-reaching ramifications in terms of brand image. "I think this will be a turning point for the brand, how people perceive this brand and how people look upon this brand," Fitzgerald added. "This one will push the envelope definitely further... A lot of people will be surprised.” Almost exactly one year ago, the was first shown, and the production version is due to arrive sometime in 2019, though the concept’s powertrain will be ditched. Instead, a conventional internal combustion engine, likely either (or both) the turbocharged 2.0-liter inline four and the 3.3-liter twin-turbo V6 from the will be offered to buyers. A hybrid plug-in is also very likely in the not too distant future. As to what Genesis will show next month, we’re hoping to see a new Genesis coupe halo model. The brand has everything it needs, powertrain, platform, design, etc., to make that happen.